Supercapacitors provide the highest capacitance of any practically available capacitor, up to thousands of farads, with working voltages of a few volts. Electrolytic capacitors range downwards from tens (exceptionally hundreds) of thousands of microfarads to about 100 nanofarads—smaller sizes are possible but have no advantage over other types. 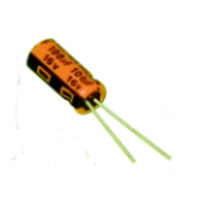 Other types of capacitor are available in sizes typically up to about ten microfarads, but the larger sizes are much larger and more expensive than electrolytics (film capacitors of up to thousands of microfarads are available, but at very high prices). Electrolytic capacitors are available with working voltages up to about 500V, although the highest capacitance values are not available at high voltage. Working temperature is commonly 85°C for standard use and 105° for high-temperature use; higher temperature units are available, but uncommon. Unlike other types of capacitor, most electrolytic capacitors require that the voltage applied to one terminal (the anode) never become negative relative to the other (they are said to be "polarized"), so cannot be used with AC signals without a DC polarizing bias (non-polarized electrolytic capacitors are available for special purposes). Capacitance tolerance and stability, equivalent series resistance (ESR) and dissipation factor are significantly inferior to other types of capacitors, leakage current is higher and working life is shorter. Capacitors can lose capacitance as they age and lose electrolyte, particularly at high temperatures. A common failure mode which causes difficult-to-find circuit malfunction is progressively increasing ESR without change of capacitance, again particularly at high temperature. Large ripple currents flowing through the ESR generate harmful heat. Two types of electrolytic capacitor are in common use: aluminum and tantalum. Tantalum capacitors have generally better performance, higher price, and are available only in a more restricted range of parameters. Solid polymer dielectric aluminum electrolytic capacitors have better characteristics than wet-electrolyte types—in particular lower and more stable ESR and longer life—at higher prices and more restricted values.